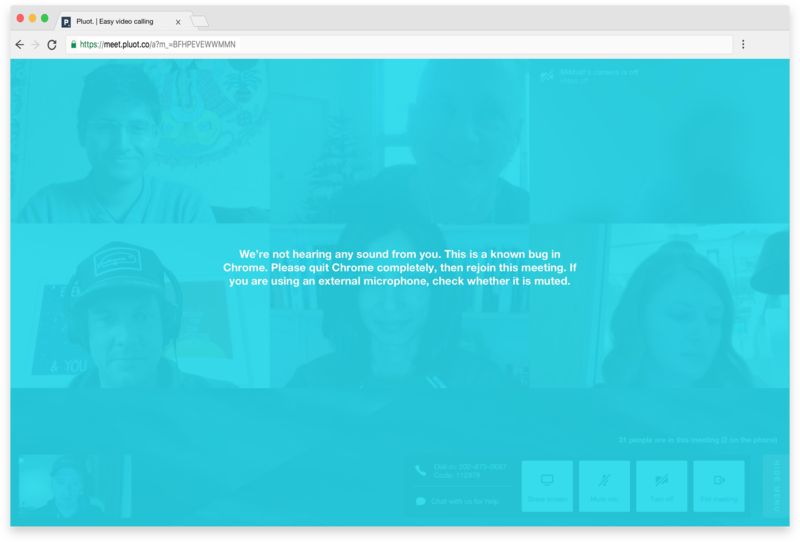 We apologize: Chrome has an audio bug. Other people can't hear you....and you've checked you aren't muted and your volume is up. It's likely you've been hit by the Chrome audio bug. The person who can't be heard needs to fully quit Chrome, and rejoin the meeting. Important! Don't just close the tab, or close Chrome. The person who can't be heard needs to completely quit Chrome and rejoin. The Chrome audio bug affects users who have joined from a computer. Sometimes, Chrome gets overloaded and stops accepting audio input. We typically see this happen when too many tabs are open, or Chrome hasn't been restarted in a while.